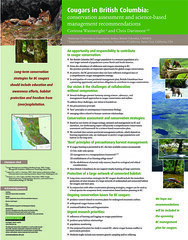 In May 2008, Raincoast presented a conference poster at the Mountain Lion Workshop in Sun Valley, Idaho. The poster, entitled “Cougars in British Columbia: conservation assessment and science-based management recommendations”, includes highlights from a forthcoming report that examines opportunities for cougar conservation. Based on our review of cougar ecology, research and management in BC and elsewhere, our report will provide a conservation assessment and framework for a science-based conservation plan. Long-term conservation strategies for BC cougars should include education and awareness efforts, habitat protection and freedom from (over)exploitation.